Once again there is only one picture of the four of us together. 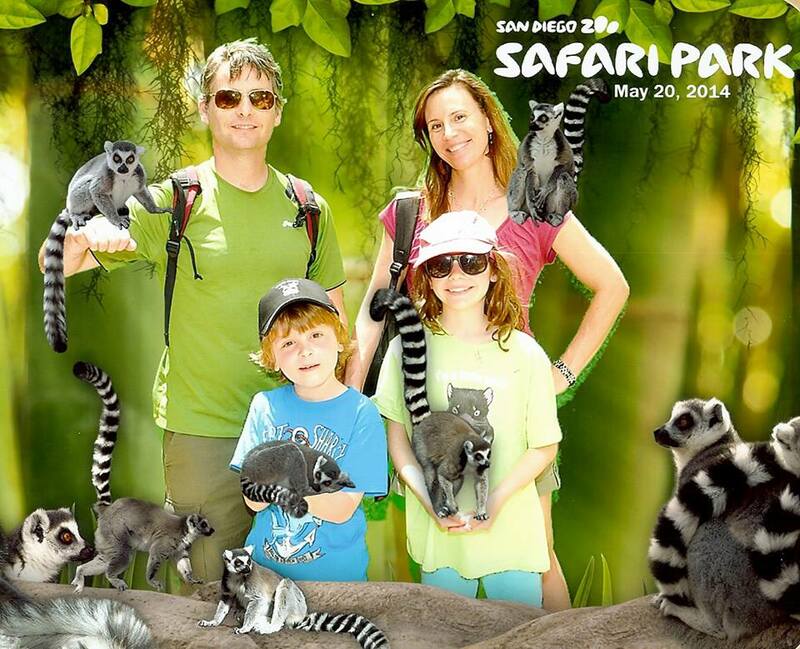 Here we are holding lemurs in San Diego on a wish trip granted by the Rainbow Society of Alberta. 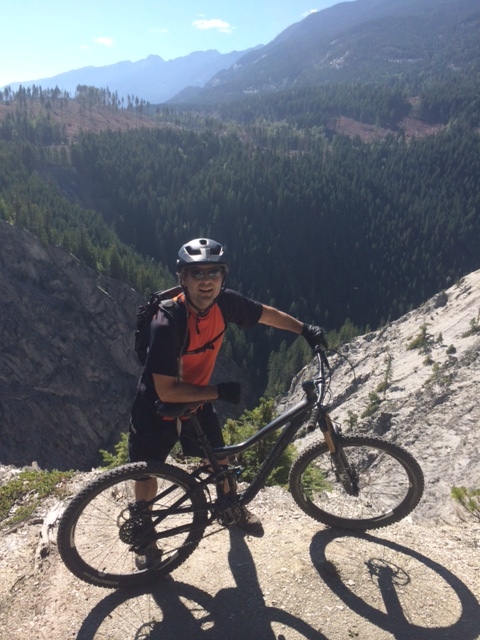 Blake continues to devote an unbelievable amount of his spare time to mountain biking. He travelled to Moab for a biking bromance with three buddies in April, and followed it up with trips to Fernie, Kicking Horse and, most recently, Canmore for some winter biking. I knew he might have a problem when one night he came running over with an issue of Fat Tire Enthusiast to show me that his Giant Trance Advance SX was voted the best mountain bike in the galaxy by a panel of IPA-drinking gear heads experts. Also, the garage has been deemed unsafe for the Giant; it rests on a pedestal in our storage room. Blake mountain biking in Golden, B.C. When he’s not pedalling his baby, Blake trains our dog Piper. This consists of leashing her to a ski pole, fastening the pole to his bike and then riding while Piper sprints beside him. Oh wait, he’s actually also biking when he does this. When he’s not mountain- or dog-biking, Blake works on puzzles with Avery, wrestles with Bennett, and showers me with affection. In the blink of an eye Avery seems to have grown from a little girl into a mature big kid. She’s enjoying Girl Guides, piano and gymnastics, and will be shredding the gnar starting a ski program in Fernie later this winter. Her favourite mode of transportation is cartwheeling and hand-standing, and as a result her biceps at age nine are comparable to Linda Hamilton’s from Terminator 2. Avery loves to read, draw detailed pictures, recount her boring and impossibly complicated dreams and watch The Amazing Race. Avery Ford, age nine, grade four. In Vernon, B.C. this past summer. For all her growing up though, she’d still rather chase frogs than boys, and give us endless cuddles at bedtime. Can I freeze time? Pretty please? Bennett has had a big year that included learning to link turns and stop while skiing (without me having to yell, “Pizza! Stop! Turn!” like a crazy lady), becoming more comfortable on his adapted bike, and being granted an amazing wish trip to San Diego by the Rainbow Society of Alberta. Bennett Ford, age seven, grade two. Dressed as Super Why for Halloween. 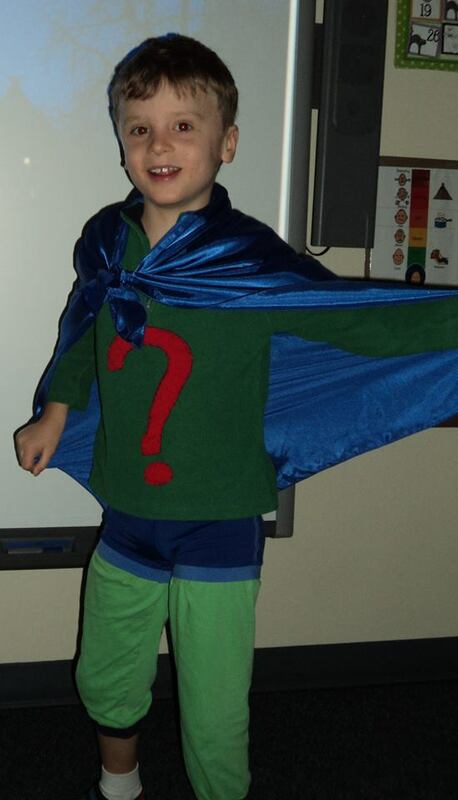 He went as Super Why for Halloween, which seems to have granted closure on his year-long love affair with Whyatt and the Super Readers. He’s moved on to Dora and, randomly, YouTube videos of Debbie Reynolds singing Tammy. He now shrieks sings Tammy to Piper when she’s in her kennel, which is yet another way he torments the dog. Bennett continues to challenge and surprise us and, while it sometimes seems like there aren’t enough band-aids to help him feel better when his feelings get hurt after a scolding (“Stop holding Piper by her neck, Bennett!”), there’s no better sound than that kid’s belly laugh. I wish I could report that Blake’s and Avery’s intensive Piper training had cured the dog of eating her own poop. But no. She is still disgusting. We continue to be proud of her actual accomplishments, which include: learning how to climb a ladder, roll over and jump to catch a frisbee in mid-air; being the cutest dog at the dog park; and chasing those ugly black squirrels and annoying magpies that wander into our yard. Piper barks in a high-pitched kind of sissy way when she does this, but we’ll overlook that. 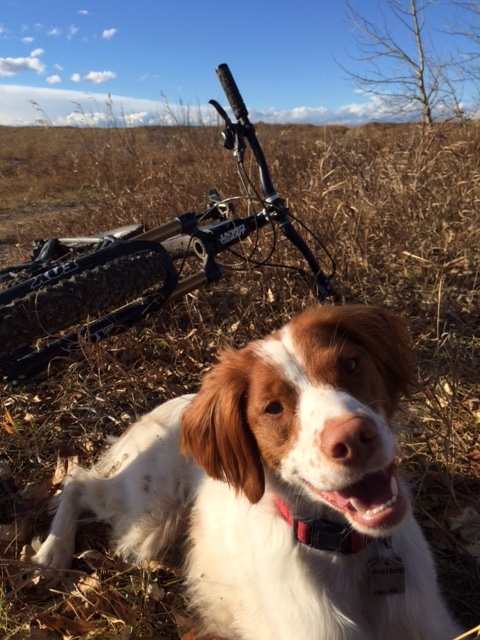 Piper after a mountain bike ride/run at Nose Hill. After a bout of lice, kennel cough and an ear infection this past year I was ready to give Piper away rethink our decision to get a dog, but now that she’s healthy again and I no longer have to pick up turds (because, um, you know… dessert!) I think we’ll keep her. Lisa (that’s me) has upped her travel game in 2014, thanks to Blake’s more flexible work schedule, and has recently enjoyed press trips to Guadalajara, Whistler and even a short jaunt to Toronto to help judge a Cointreau cocktail competition. Blake and I managed to sneak in three adult trips (cat skiing, Sayulita and San Francisco — don’t go there in July; it’s freezing) as well as family trips to San Diego, Vernon and Dallas. Up next: Costa Rica in 2015! 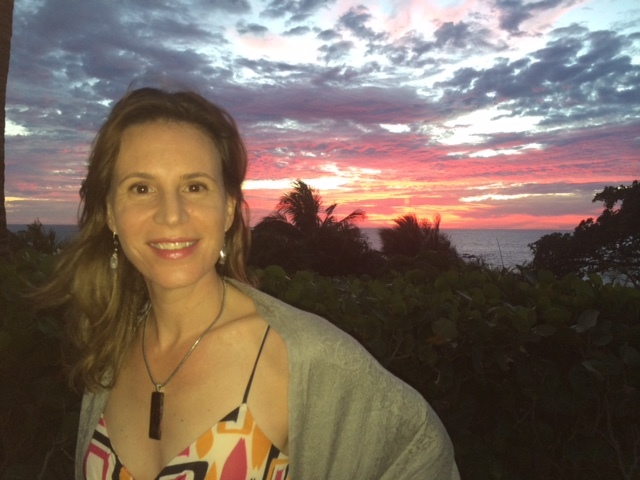 Enjoying a Mexican sunset in Punta Mita. My hypochondriac tendencies continue as I visited the doctor a lot for minor complaints such as an ongoing shoulder injury from Piper’s sled-dog-like pulling tendencies. The upside of this? My goal for this winter is to shovel the sidewalk zero times. I have also started holding my iPhone at arms length to read. Blake insists that I need reading glasses, but I will read the damn device from across the room for spite to prove my unrivalled far-sightedness before I invest in readers, even if they come with hopelessly dorky cool lights on the sides. We’re looking forward to a relaxing Christmas break with family and friends that includes lots of pow-pow. Happy holidays! It’s fair to say the secret’s out on The Nash, the new Michael Noble restaurant that opened in Inglewood late last month. Every time I’ve driven by it’s been packed, and last week when I met girlfriends there it was abustle — all tables taken, and standing room only in the 50-seat Off Cut Bar. The new foodie hub is bringing late-night traffic to Calgary’s east end and it’s great news for my ‘hood. 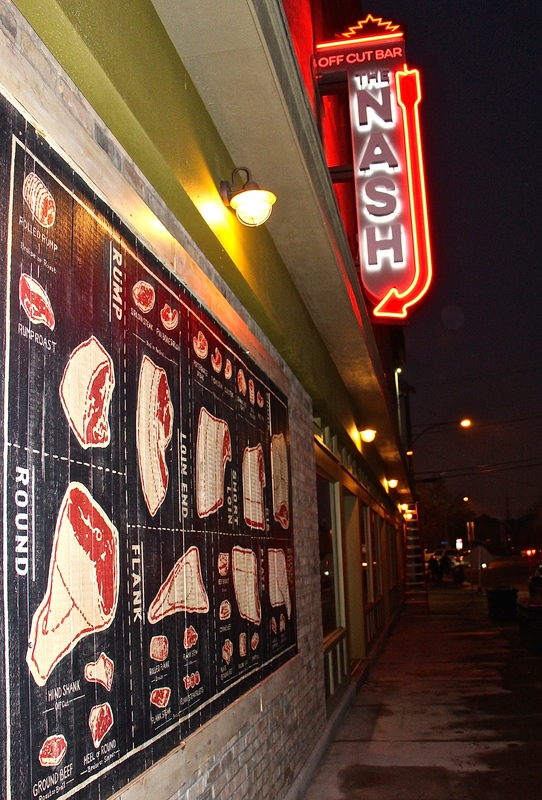 Chef Michael Noble’s eagerly anticipated The Nash Restaurant and Off Cut Bar are now open in Inglewood, Calgary. What’s even more exciting for me — and for Calgarians who like a classy watering hole — are the fantastic cocktails being shaken and stirred at Off Cut. I’ve been slowly working my way through the list and have enjoyed every cocktail I’ve tried thus far. 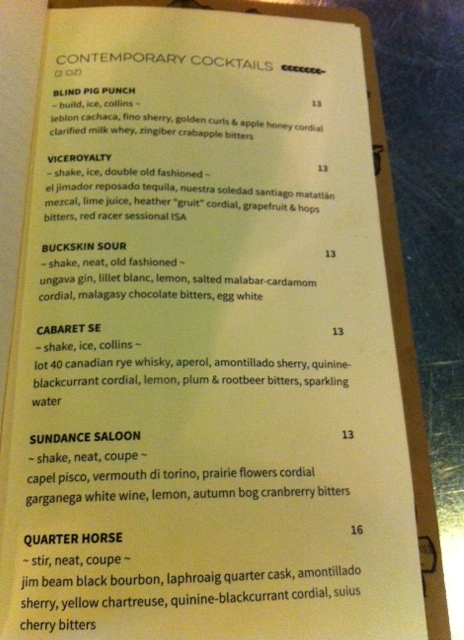 I love the strength of the bourbon-based Quarter Horse, the tart-yet-light grape (pisco) essence of the Sundance Saloon, and the bitter wholesomeness of the new Cynar Flip. My friends and I also love the New Orleans Ginn Fizz (one pal even asked if I could pretty please get the recipe and then make her one every Friday at 4:30 p.m.); however, it’s reviled by the bartenders, who need a full two minutes to shake it, so sadly, it’s coming off the menu. The Nash’s liquid pleasures are a mix of craft and classic cocktails. Pictured above are descriptions of six sips whose names hold historic significance. But if I have to pick one drink that’s my favourite, it’s the Buckskin Sour, a smooth, herbal gin-and-Lillet delight that’s not unlike a Corpse Reviver No. 2 in sour form, but with cardamom syrup instead of Cointreau. The drink is named for the buckskin-coloured horses that used to be frequent visitors to Calgary’s East End Livery, located next door to The Nash. The horse-cocktail connection makes me think of that old saying, “You can lead a horse to water but you can’t make him drink,” with a notable twist: You can lead Calgarians to these cocktails, but making them drink shouldn’t be a problem! 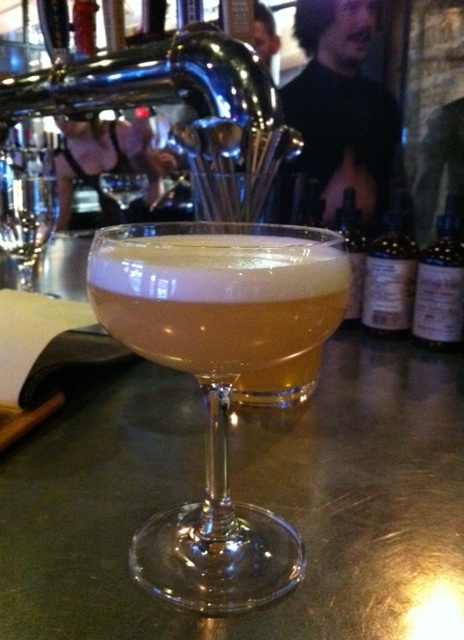 The Buckskin Sour isn’t just beautiful in the glass — it’s delicious to drink too. Method: Shake all ingredients except bitters with ice and serve straight up in a coupe. Garnish with three dashes of bitters, then draw hearts by swiping a toothpick through them. Kyle works at the Perot (as in Ross) Museum of Nature and Science where he does educational outreach and planetarium shows for school groups inside a portable Nomad Dome planetarium. We were treated to a private show and got lost in space as Kyle zipped us from our night sky and solar system, to the Milky Way, and then to the far reaches of the universe, where we felt pretty insignificant. Just today Avery recalled the experience when we looked up and saw a half moon on the walk to school. 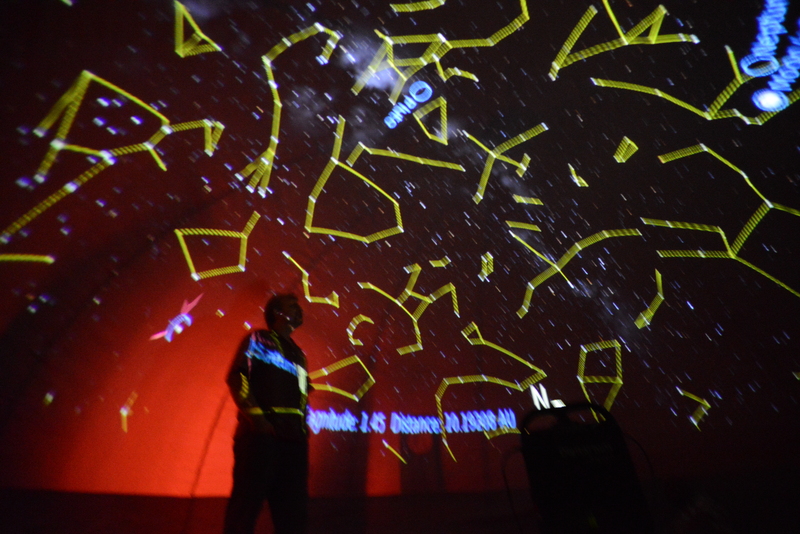 “I felt pretty small inside Kyle’s planetarium,” she said. This portable planetarium can take you to the far reaches of the universe, with the bonus that you can transport it anywhere in the world. Photo courtesy Kyle Doane. 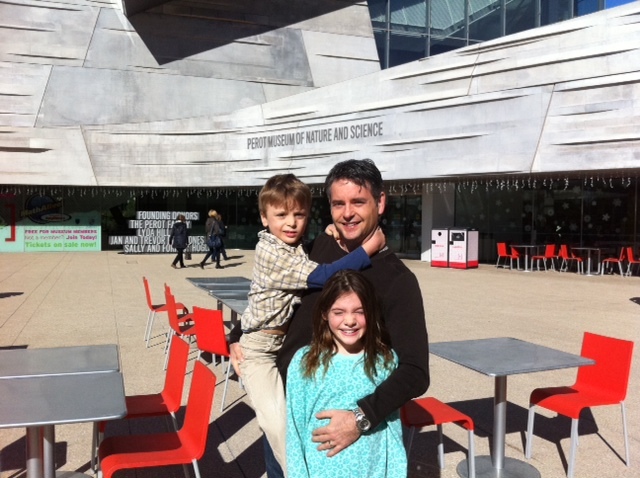 The Perot Museum is a beautiful facility that just opened two years ago. It’s basically a science centre-meets-natural history museum so there’s tons for kids to do and ogle. 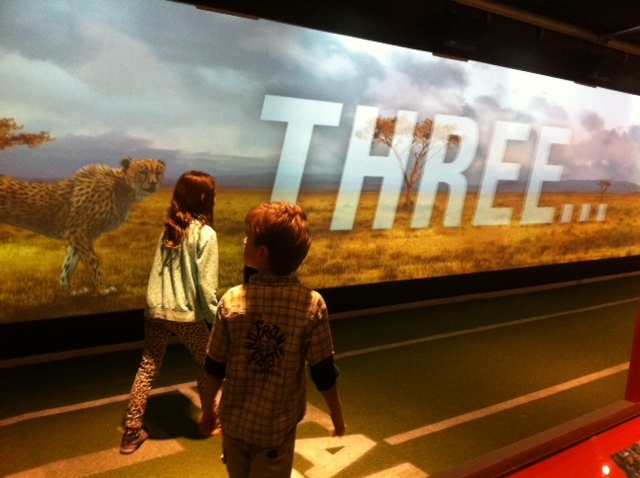 We hung out in the hand’s-on children’s museum, then Avery and Bennett raced a (virtual) cheetah inside the sports hall (the cheetah was like a blur whizzing past — blink and you missed it). We ascended the building’s gazillion escalators and then worked our way down the museum portion through the dinosaur exhibits and the gems and minerals hall (because my husband is a geologist). There was even a singing cartoon video about oil extraction that would make Jed Clampett, and visiting Albertans, proud. Avery and Bennett get ready to race a cheetah inside the sports hall. Walking around Dallas after dark was like attending ZooLights for free (minus the animal shapes). Many homes actually pay companies to come and wrap giant oak trees in lights, and encase entire hedges in a kind of light netting. It was all very fancy, and I can’t imagine what this would cost (if you have to ask, you clearly can’t afford it), but it was great light candy. 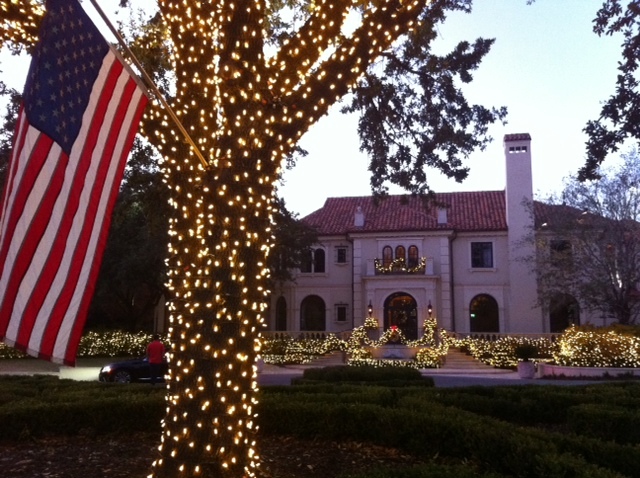 American pride extends to the holiday lights in Dallas. It’s all very tasteful, even if some of the homes are a bit too faux Versailles villa for my liking. The kids loved hanging out at Auntie and Uncle’s house, swinging in the funky hammock-style swings in the backyard, whacking open a piñata for Kyle’s birthday, and chasing the animals around mercilessly (Bennett). It brought into focus the meaning of the holiday — giving thanks for food and family, spending quality time with loved ones, and then trampling strangers to get a good deal at Walmart the next day. 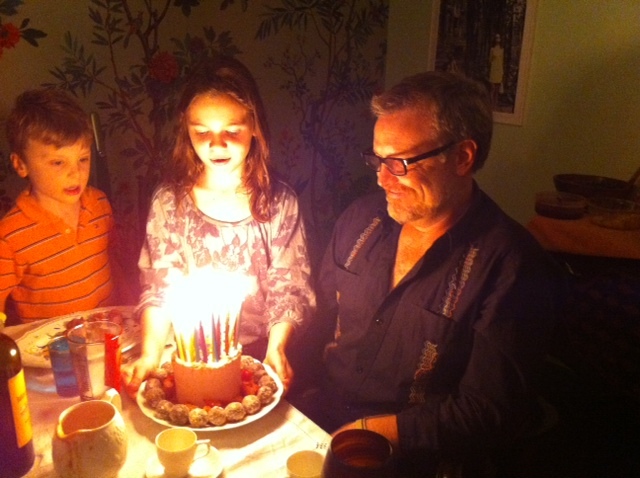 Bennett and Avery deliver a birthday cake to Uncle Kyle. 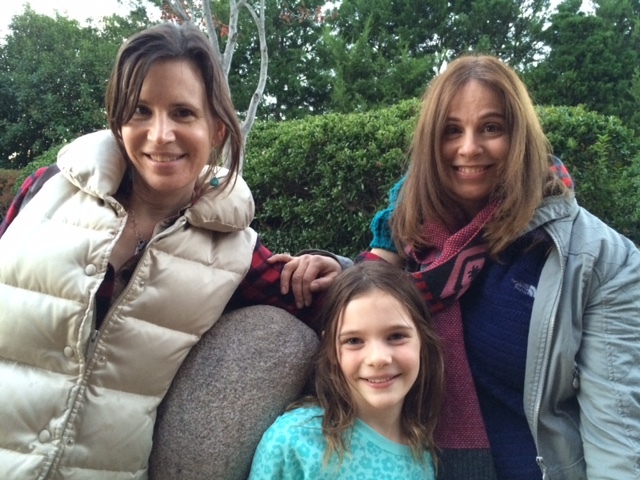 The gals enjoy an evening stroll along Turtle Creek in Dallas. Today, nearly two years after a gunman killed 20 children at Sandy Hook Elementary School in Connecticut, my daughter’s elementary school in Calgary will practice a lockdown drill. The point of this kind of drill is to teach students and teachers what to do — lock classroom doors, hide, be quiet — in case a disturbed person decides to harm innocent children or their educators inside our neighbourhood school. A constable will be supporting teachers and children with this procedure. Avery’s school is having lockdown practice today. I asked Avery why they were having lockdown practice. “It’s in case someone comes into the school who shouldn’t be there, or if a wild animal gets in, like a deer. Even though they look nice and tame they’re still wild and could hurt someone,” she said, illustrating the beautiful naiveté of a nine-year-old. When I was a kid, we didn’t have “Lockdown Practice” at school. My biggest school worries, after securing a good seat on the bus, were not getting picked last at dodge ball and beating Kim Van Eeckhout at death circles on the 1-2-3 bars (where you spin around backwards by your knees for a full revolution without touching your hands to the bar). Oh, and I wasn’t supposed to buy lickum stickers from strangers that showed up at the playground because they might be laced with some kind of poison (a parental euphemism for LSD). It never crossed my mind that someone with a gun would walk into the school and start picking off little kids. 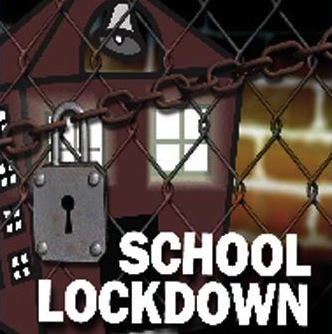 The closest I ever got to “lockdown” was vicariously — through the stories my mom would tell me about the regular tornado drills she and her classmates practiced during elementary school after the air siren started blaring. She grew up in Kansas where, evidently, Wizard-of-Oz-calibre tornados blew through almost weekly. 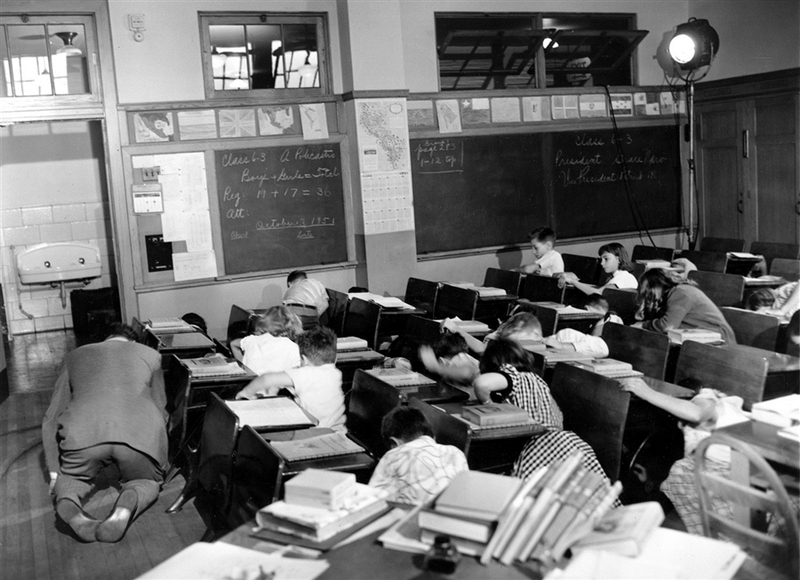 My mom had to hunker under her school desk during regular tornado drills in Kansas during the 1940s and 50s. I listened to these tales with wonder and envy. Hiding under a desk seemed way more exciting than simply exiting the building like we did during the annual school fire drill. As I entered junior high, with the spectre of the cold war looming larger than ever, I wondered why we never had Nuclear War drills (it was 1983 — remember The Day After?). I’m pretty sure this kid wouldn’t be winking and thumbs-upping if this happened in real life. In contrast, today’s madman — or bullied, misunderstood youth — can show up anywhere, at any time, and wreak soul-wrenching devastation on the relative peace that described life before his appearance. I’m sad that this is the reality for my daughter. I’m glad she doesn’t know the real reason they’re going through this drill, but my heart still hurts. As much as I hate the thought of her and her grade four classmates silently locking themselves in Room 13 for an hour this morning — and I loathe the reason they’re doing it — I’d rather her school is prepared in the unlikely event that something akin to the Sandy Hook tragedy should happen here at home. Earlier this summer Cointreau came to Calgary to host a cocktail competition as part of the French spirit’s cross-Canada tour to crown “Mademoiselle Cointreau-Canada.” Model Milk’s Madeleine MacDonald won with her inventive and delicious In Memoir cocktail. The tour had previously been to Vancouver (two winners), and then continued on to Toronto (four winners) and Montreal (three winners). 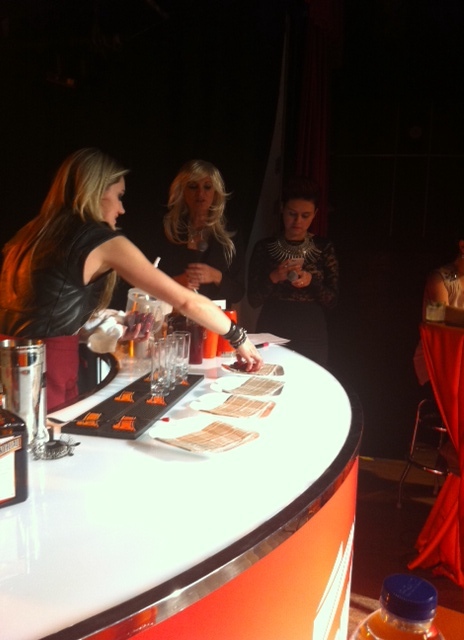 In total, 10 outstanding mademoiselle bartenders won a trip to France to visit the Cointreau Distillery in Angers. Fast forward two months and those liquid chefs, including MacDonald, were pitted against one other in the Mademoiselle Cointreau finale, held at Revival Bar in Toronto on Monday night. Competitor Rachel Osborne readies the bar Monday night at Revival Bar in Toronto while emcees Dee Brun (Cocktail Deeva) and Lolitta Dandoy look on. I was asked to judge this competition alongside Alfred Cointreau (the great-great-grandson of founder Edouard Cointreau), Nishan Nepulangoda (bartender at Blowfish in Toronto) and Fanny Gauthier (owner of Ateliers & Saveurs in Montreal). As we sipped our way through the cocktails, the calibre of the finalists became apparent. My favourite cocktail for taste was the Femme Fatale, a perfectly balanced sour from Bar Isabel bartender Leah Mucci. However, we based our marks on not only the drink’s taste and balance, but on the cocktail’s name and story, originality and inspiration, presentation, and execution. Leah Mucci affixes a mint leaf and candied kumquat garnish to her Femme Fatale cocktail, a sublime twist on a sour. By far the best story of the evening came from winner Rachel Osborne of Philemon Bar in Montreal. Hers was a tale of beginnings and perfect endings; of Cointreau’s start as a distillery making cherry liqueur, to her own start as a bartender at age 12 creating coconut cocktails for her mother. The perfect ending, of course, was how the two beginnings came together — cherry juice shaken with Cointreau and topped with coconut foam. 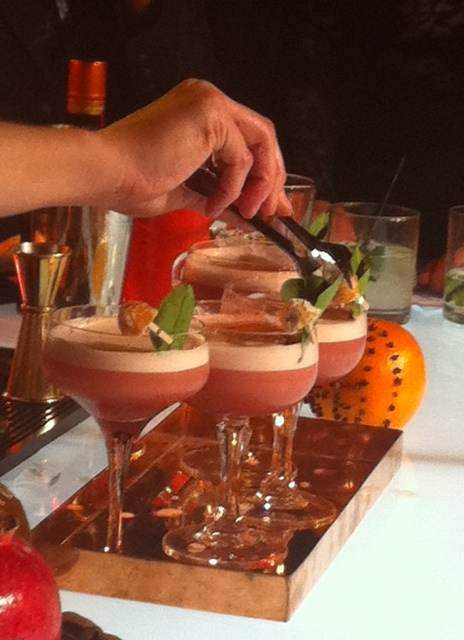 It also helped that the drink was delicious and beautifully presented and executed. For her effort Osborne wins a trip to Miami to meet the city’s top mixologists, and the title of Mademoiselle Cointreau-Canada. Congrats! Winning cocktail Le Cointreau Au Debut is a pleasing mix of Cointreau and cherry juice by bartender Rachel Osborne. Extra points for presentation! Garnish: Dried lavender and a spray of liquid fleur de sel (hand-harvested sea salt) mixed with a small amount of cherry juice for colour. 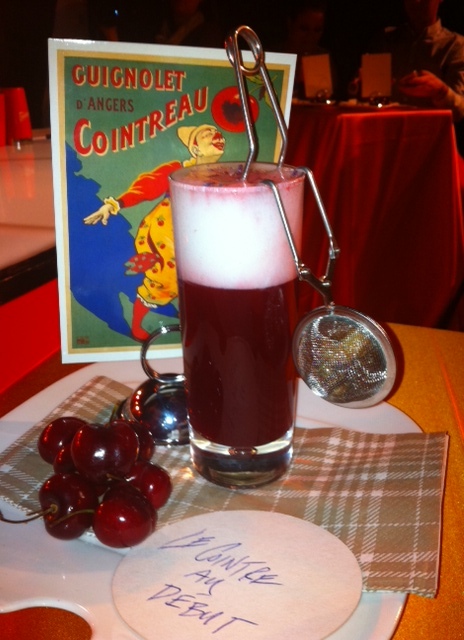 Method: Combine Cointreau and cherry juice in a shaker with ice and give a short shake (you don’t want too much dilution). Make the foam in a syphon (or go foamless — the foam sort of got in the way of the main event, the Cointreau cherry juice, in my opinion). Strain into a highball glass with ice and top with the coconut foam. Sprinkle on the dried lavender and spritz with the sea salt-cherry juice mixture. When Avery was in grade one I read her Charlotte’s Web as a bedtime story over the course of several weeks. I loved sharing this classic children’s story about friendship with my daughter, and watching her excitement at Wilbur the pig’s triumph (escaping the axe, thanks to the web-spinning efforts of his spider friend), as well as her sadness over Charlotte’s inevitable death (though Avery was happy three of Charlotte’s spider babies decided to live in the Zuckermans’ barn). 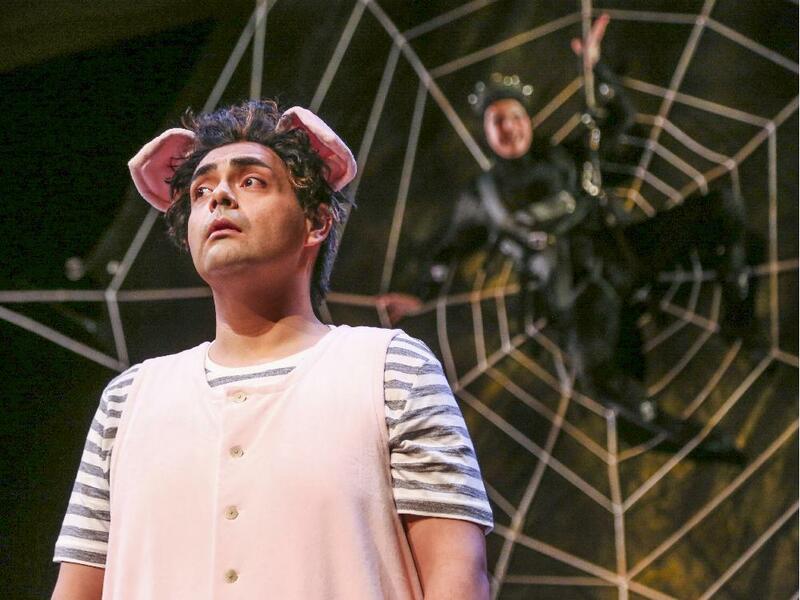 Charlotte’s Web is running through Dec. 31, 2014. 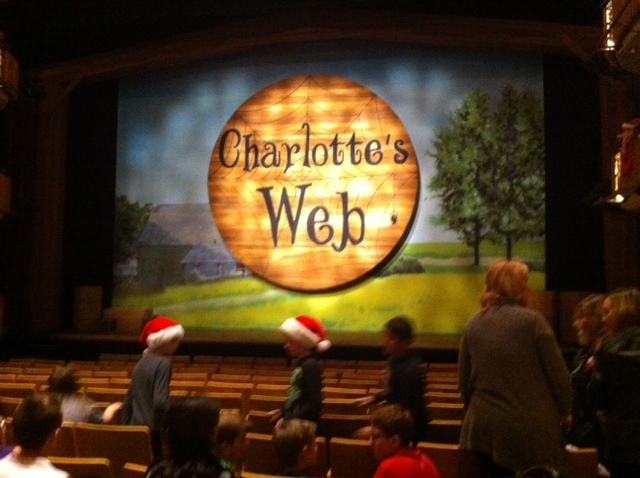 So it was especially satisfying to sit beside Avery and her classmates on a school field trip this week and watch the tale come to life through Alberta Theatre Projects’ production of Charlotte’s Web (running through December 31). 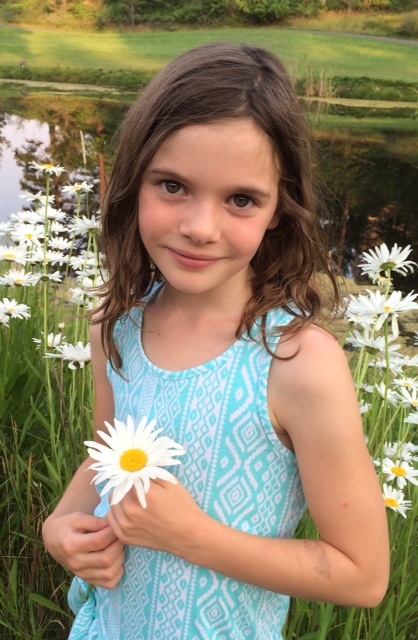 What made the experience even more enjoyable was the fact that one of her grade four classmates from Colonel Walker School, RubyJune Bishop, plays Fern Arable, and RubyJune’s parents star in the production as well. 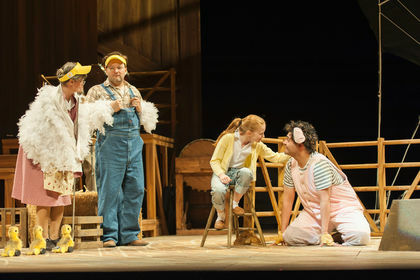 Fern Arable (played by RubyJune Bishop) talks to Wilbur (played by Guillermo Urra) during a production of Charlotte’s Web. Photo by Calgary Sun. It was Avery’s first time watching live theatre and she was captivated from the beginning, and even more so when Charlotte, played by the enchanting Manon Beaudoin, first descended down to her web from the barn rafters. From her web, Charlotte talks to Wilbur for the first time. Photo by Crystal Schick, Calgary Herald. “I really like this Mommy!” Avery whispered to me as Charlotte spun mesmerizing circles around her web, spelling the words “Some Pig,” “Terrific,” “Radiant” and “Humble” to describe her bovine friend to save his life while her own was slipping away. Avery also loved “Uncle,” the fat, cowboy-hat wearing, Texan-inspired pig that threatens to take first prize at the fair. 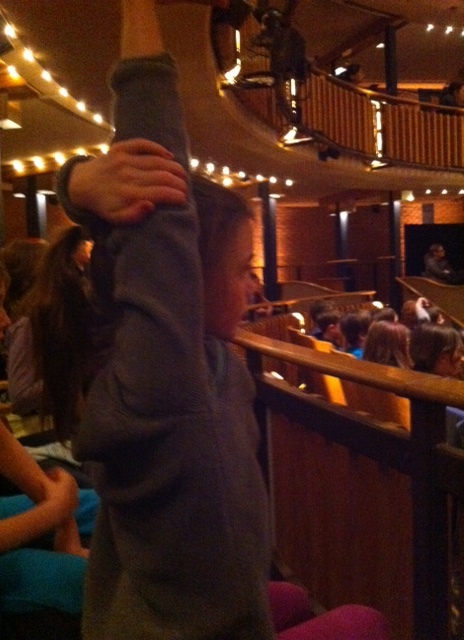 Avery strains to have her hand noticed during a Q&A session with the Charlotte’s Web cast. “Does anyone ever step on your tail?” one student asked Templeton (the rat). “All the time,” he replied. “What’s your favourite part of the play?” someone asked Wilbur. “When I first meet Charlotte and when I do my ‘Radiant’ dance,” he said. This is where he executes the Charleston, the robot and then moon walks to prove that he is, indeed, radiant. It’s one of many funny moments. “Why did Alberta Theatre Projects choose to do Charlotte’s Web out of all the classic children’s stories?” asked another student. “It reflects our values,” replied the education outreach coordinator. It is a well done, heart warming story of friendship. And Avery was especially proud to see her friend RubyJune do such an amazing job.